Hot off the heels of my review of the amazing Q Acoustics 3050i, Q Acoustics decided to send along a pair of their 3020i Bookshelf speaker for a run through. How could I ever pass up such an offer? Let’s do this! Crystal Acoustics is a niche-within-a-niche kind of company. It sells high-value speaker systems directly to customers through the Internet. Not just any speakers, though. Crystal specializes in THX certified home theater systems. I've reviewed several Crystal Acoustics speakers, ranging from smaller THX Select certified floor-standers, up to their THX Ultra2 certified TX-T3SE. Now comes the TX-T2 SE, a mid-sized floor standing speaker that carries the THX Ultra2 badge. Are the TX-T2 SE's the best of both worlds, combining a smaller size with Ultra2 performance? I think it's best in reviewing a modular-style 5.1 sub/sat speaker system to get the obvious of out of the way. These systems will not rival large boxes for scale, dynamic range, or efficiency no matter how much power you feed them. Nevertheless, they will do one thing that the big 5.1 speaker systems can't: they will fit in any room. Such is the case for the B&W (Bowers & Wilkins) MT-60D. The last several years have seen an explosion in digital and streamed audio - never before has it been cheaper or easier to distribute audio around ones house or apartment. From the advent of protocols like Apple's Airplay or Pandora . . . to Squeeze Box and Sonos, making our digital music accessible anywhere is almost an obsession with everyone. To help satisfy that obsession, Vanatoo offers the Transparent One Active Bookshelf Speakers, that have a digital input. 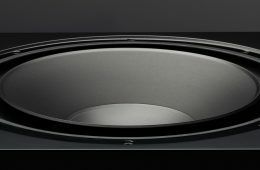 Made in Canada, Newform Research manufactures unique ribbon loudspeakers and sells them factory direct worldwide. Their ribbon designs offer the transparency, detail and sound staging of the classic large panel electrostatic and ribbon loudspeakers, but because of their narrow compact footprint, are easier to drive and setup, even in smaller rooms. Here, we review a pair of their ribbon towers, which are a hybrid design, with a 15" ribbon as the tweeter, and six conventional cone drivers for the mid/bass. Today's consumers have lots of choices to fill their home with music inside and out. I, for one, have a rapidly growing digital music library and I've been on a quest to find better ways to enjoy this music while in the great outdoors ("My Backyard"). Definitive Technology's AW 6500 might just be the answer.